We're trying to get back to eating healthier dinners and smaller portions. Between our return from Christmas in GA and New Year's in Pittsburgh, we decided to have crab cakes and Parmesan Roasted Cauliflower for three weeknight dinners. I've never been a huge fan of raw cauliflower or boiled cauliflower, the cauliflowers of my youth. But roasted cauliflower is another story. It's delicious. We usually make Lemon-Mustard Butter Roasted Cauliflower but feel a little guilty about the butter. This time, we decided to try olive oil, onion, thyme, and parmesan. The cauliflower gets very browned, almost black, and when we took it out, it was smoking! It's possible it blackened/smoked because we forgot to "toss occasionally" since we were making and frying the crab cakes while the cauliflower roasted. 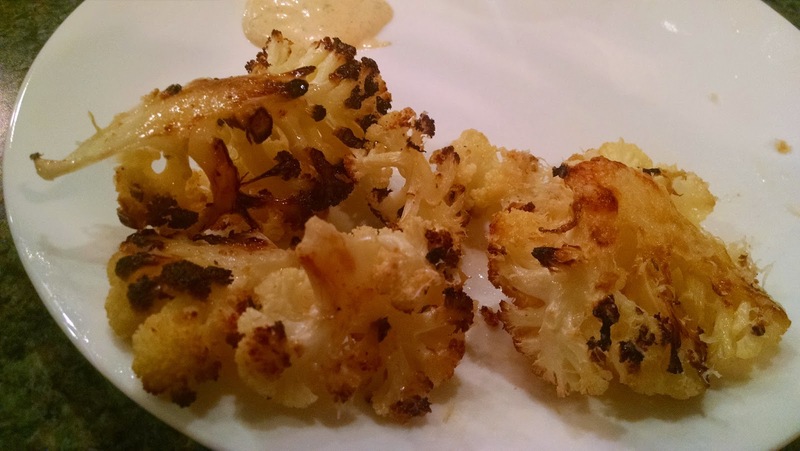 The onion also gets dark and adds a terrific flavor to the cauliflower. I couldn't really taste the thyme, but the fresh thyme we used is the thyme that we're trying to keep alive in the dining room and it might be a little... sad? Lacking in flavor? Brown, not green? Barely hanging on? We omitted the garlic & salt but added lots of pepper and just enough parmesan to give a hint of that cheesy flavor. Definitely a make again version of cauliflower. Cauliflower is a vegetable that I also have not ever been a huge fan of. This recipe looks delicious and I will definitely need to try it!